[New for 2018] If you follow me on twitter than you may have noticed that I try to encourage Turkey Hill to add more all natural flavors. I feel a little like a broken record but their all natural line up is basically my nighttime snack for about 85-90% of my evenings. 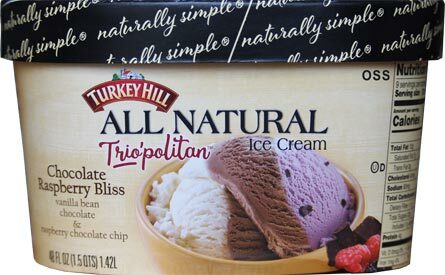 I love old fashion ice cream and nothing reminds me of good 80s mainstream ice cream like Turkey Hill All Natural does. I wish more companies would move this way rather than messing with sugar replacement. The biggest twist with this flavor (besides being a Trio) is that they swapped out their regular chocolate flakes for itty bitty chocolate chips instead. Most of the time these tiny chips annoy me greatly, but on occasion a company uses them properly and I feel like they work here actually. Maybe it helps get the bit count up since they are only in a third of the ice cream? Now I forgot to actually write down my initial thoughts (too many reviews in the queue) but as you might suspect, I do like this one. 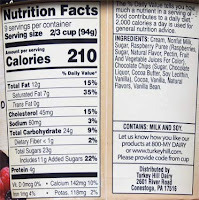 I've never loved-loved their all natural raspberry ice cream, but thankfully you can tweak the flavoring by scooping in chocolate or vanilla (or both). I'm not even doing it on purpose, but I manage to have a different flavor experience every time which is (usually?) a positive. So yeah, I like this one, though I wouldn't call it love. It's more that I appreciate the change up. Like I said, I usually have their all natural line up at the end of the day and now stores have one more flavor they can carry (since they rarely carry the whole line up). On Second Final Scooping: I just finished the container and I want to reiterate that I just don't love the flavoring on their all natural raspberry ice cream. It's not terrible, but there just isn't any love there. I will only buy this on a rare occasion to mix things up, otherwise I'll stick to either their basic chip flavors or the blackberry swirl flavor. 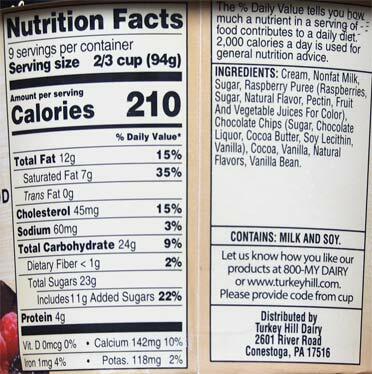 I'm not going to even try it, I feel the same about the black raspberry and the choc chips. I got the Americone flavor and hated every second I ate it. I think this flavor is okay. As I've said about the other "Trio'politan" flavors, they're a nice change from regular Neapolitan and a great way to save money when you're craving more than one flavor. I won't purchase this one as often, because it's only at the "other" store, but I would probably try it again. 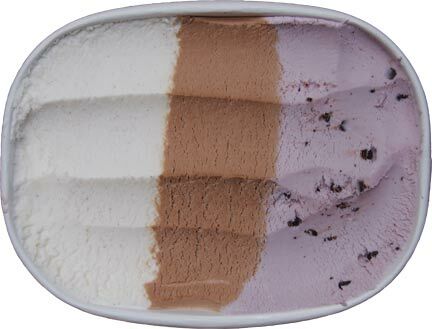 I think the key is to scoop across the carton so all three flavors are in your scoop (which you appear to have done!). Then you can enjoy the flavor mix as it softens and then melts in your bowl...if it lasts that long!